An injury, especially one in which the skin or another external surface is torn, pierced, cut, or otherwise broken. Symptoms and indications: Wounds may cause bleeding, heat, pain, redness and swelling. Causes and risk factors: Many of the common causes of wounds are everyday objects, including the following: glass, knives, pieces of wood, punctures due to needles, pins, nails, and hooks, splinters, scrapes from falling, and zippers. Animal and human bites can also cause wounds. Wounds that are dirty or do not receive prompt medical attention, if necessary, run a high risk of becoming infected. 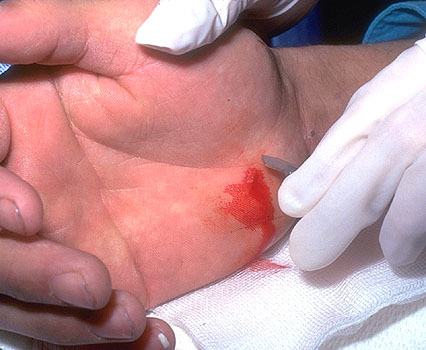 Prevention: To prevent puncture wounds, it is important to practice safety when using blunt or sharp objects. Pay close attention to what you are doing. If you become distracted, set the object aside until you can pay attention to what you are doing. Know how to use the object properly. Have good lighting so you can see what you are doing. Wear gloves whenever possible to protect your hands. Wear other safety gear, such as glasses or boots, as appropriate. Hold a sharp object away from your body while using it. Carry the object with the dangerous end away from you. Shut the power off and use safety locks on your power tools when you are not using them. Be very careful when using high-pressure equipment, such as staple guns or paint sprayers. Make sure your work area is clear of people and hazards that could interfere with the safe operation of the equipment. Store dangerous objects in secure places away from children. Teach children about safety, and be a good role model. Do not use alcohol or drugs when you are handling sharp objects.